Nothing is better than a fun get-together! 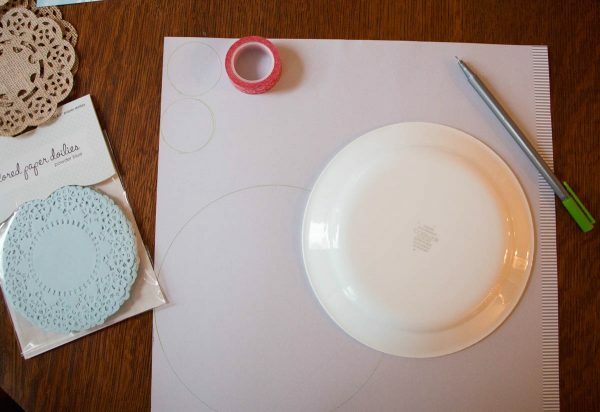 There can be the times we pull out all the stops, using fancier dishes, finding the fun decorations, and making sweet decorations and food from scratch. Since we’ve had kids, the parties have been no less fun, but we have had to change up some of the decor: things are less breakable, and easier to clean, and we’ve swapped out the nice linens for a few years. The end result is actually an added bonus, since I am sure everyone feels free to enjoy themselves without worrying too much! 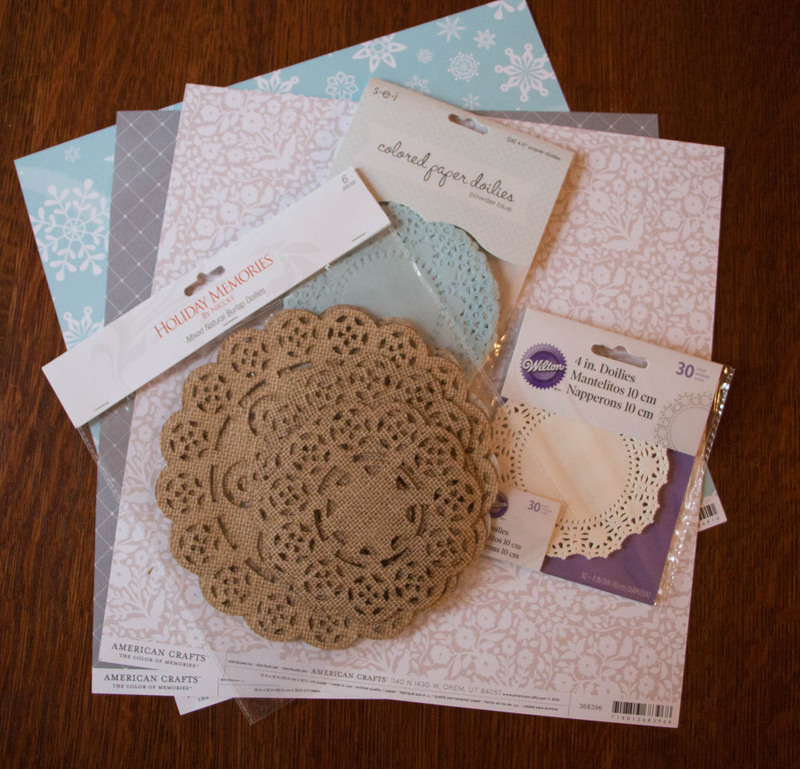 That doesn’t mean, though, that we “can’t have nice things.” Instead, we break out the crafting supplies and make something that is still personal and pretty, and which everyone of all ages can participate in: the Care Less Coaster. Made from paper doilies and scrapbook papers instead of nice linen, they can be customized for whatever theme you wish, and you can make them as simple or as complex as you like. If they become stained, there is less unhappiness since they can be tossed in the recycling bin. I am also very laid back when I’m making these, and am not worried at all about perfection! 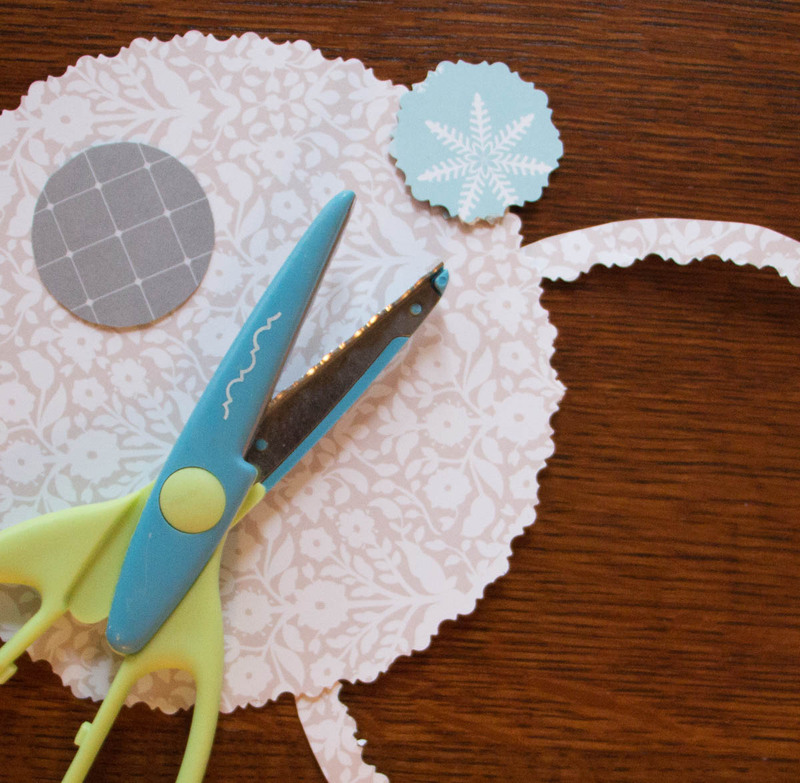 After I cut the circles out, I used my craft scissors that can cut scalloped borders to make the edges pretty. 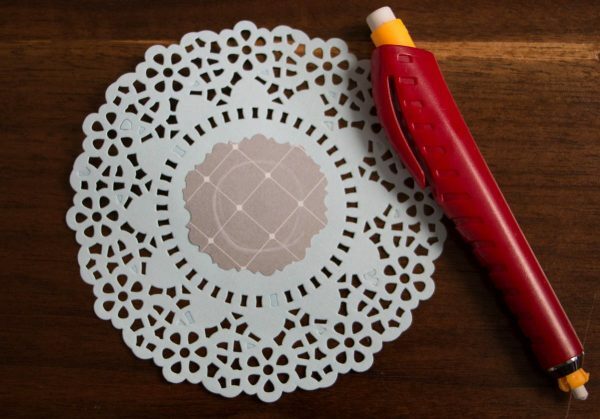 While this next part is optional, it is a good idea to do this especially if you are sewing with little kids (it takes away some of the frustration): dab a bit of glue in the center where your doilies and circles overlap, then quickly heat set with an iron. 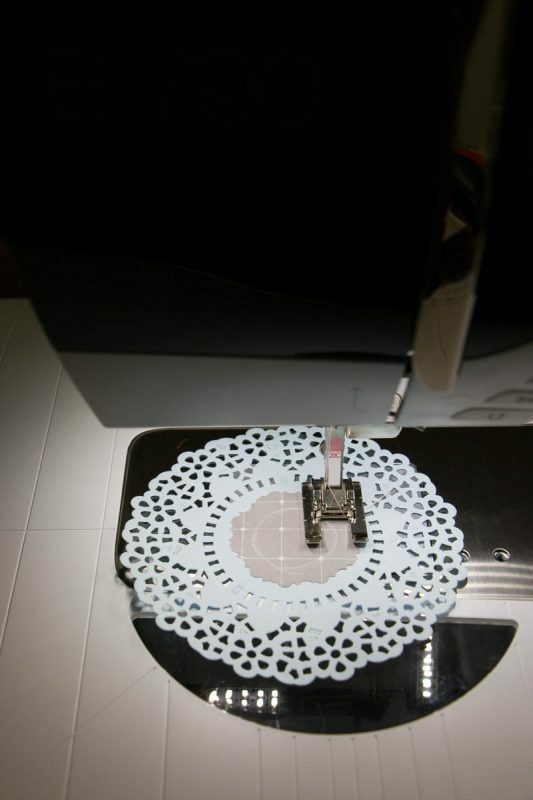 This will keep everything in place while you sew the pieces together. A note: Choose your decorative stitches with thought, since some are better than others. Better choices for stitching these together are going to have fewer backtracking stitches, since more backtracking stitching can sometimes perforate the paper enough to cause it to fall apart. Pick a contrasting thread for an even bolder design. 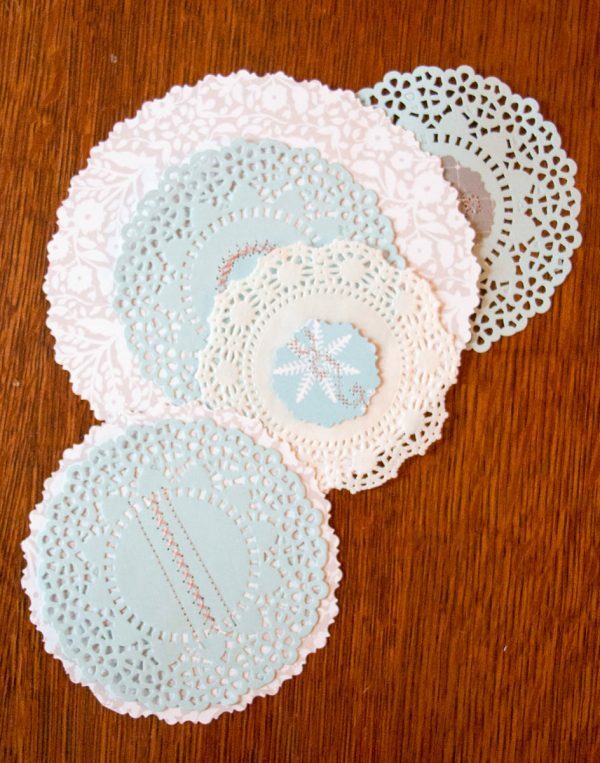 If I were making these coasters from fabric, I would simply use the Circular embroidery attachment #83, but I didn’t want the hole that would be punched in the middle to show. Instead, I used my chalk pencil to mark a circle that I would follow with my stitches. As always, make sure you use the correct foot and throat plate for the stitches you choose! I used the BERNINA open embroidery foot #20C and the wide stitch plate suitable for zig zags. Have fun and experiment! I let my kids pick out the designs and stitches they wanted with a little guidance about what to choose, and we all had a good time sewing these together. As you can see, we also did a few with straight sewing paths, and they came out more like the designs on Christmas sweaters, which was fun. I hope you enjoy adding a little creativity to your own parties, and I’d love to see what you make!